Jesus healed Mary Magdalene when he cast out her seven demons, but instead of exclaiming, “healer”, she recognized Him as “Rabboni” (or teacher in Aramaic) as he appeared to her outside the tomb (John 20:16). The friends that I value the most are those who are willing to take the time to teach me, sometimes by their words but more often by their actions. 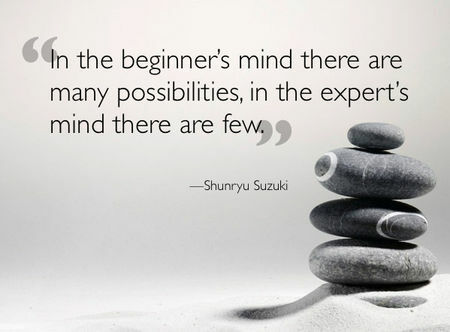 I approach them with a beginner’s mind, not knowing the answers, but eager to explore the questions. They don’t pretend to be experts by lecturing me with Scripture or putting me down because of my questions. Instead they help me to explore my faith and my purpose in serving God by honoring my willingness to approach them with a “beginner’s mind”. Some of my past relationships have existed in a complicated dance where we weren’t open and honest and everything became a competition to prove who knew more. Only when two people learn from each other can a real relationship foster and grow. The expert’s mind is cluttered with facts and superiority; there is no room for anything else. It is when our mind is empty and open to everything that God comes to dwell within us and teach us in His ways. My most precious friends are those who are willing to share our journey together with “beginners’ minds”.